How To Instant "Dig Millions of Potential Consumer Data from Facebook" in Just Minutes and You Can Get Millions of Potential Targeted Buyers from Facebook, With Just 3 Easy Steps! Facebook are the largest place for people to share their common interests, express opinion, discuss issues and post relevant content. Today, you will discover the Cheapest way to get a massive amount of Traffic from Facebook members who are interested in your topic. Simple Audiens software will take your business to a new level! Where do Leads come from? Consistent Targeted Traffic is essential for any successful business. I want to share with you a new approach to lead-generation that will deliver both quantity and quality – it is based on Facebook data. Even a complete newbie with no experience with Facebook marketing or software can set up their own profit-pulling in a few minutes! 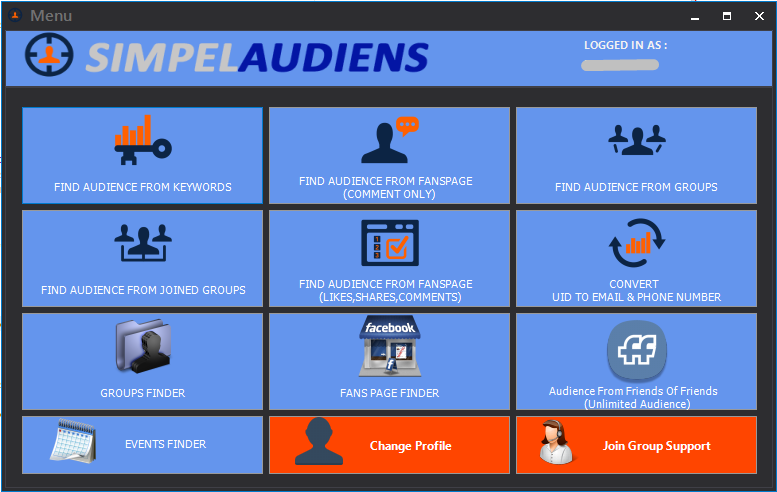 Using Simple Audiens software, you can easily find Facebook Niche Groups and Create a List of Name and Email Addresses or Phone Number of selected Facebook Group Members. The software only can capture FB users that set Email or Phone as public. This Members list can be add to FB Custom Audience list or target them with any genuine promotional method like Email Marketing or SMS/Whatsapp Marketing campaign. Send special ads including discounts, coupons, images, headlines, descriptions, call-to-actions, external links & more! You can insert bulk group ID to captures more users from FB Group. You also can insert keyword to search and find audience from FB Page. What Simple Audiens can Do? Leads from FB Friend List : 80,664 leads in one day! 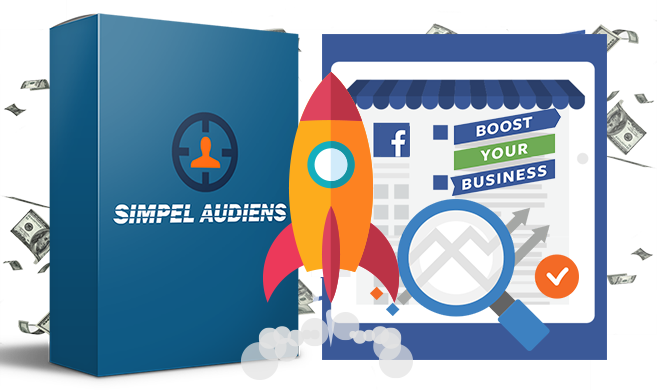 Simple Audiens Finally Makes Making Money on Facebook Hands-Free by Capture More Unlimited Targeted Leads! Don't Forget, with Simple Audiens you can follow up with them or send mass-email or SMS/Whatsapp to them at ANY TIME! - "MONEY is in the LIST"
Note: Simple Audiens is a Windows-based Program and also support Mac OS. Only FB users that set their Email and Phone as publicly can be capture. Bonus software will be given step by step. Facebook Marketing Just Not Working For You No Matter What You Try? Give Simple Audiens a Try and Watch Your Income Stream Catapult to Another Level! Stop letting your Facebook leads die a slow death… Now you can turn them into evergreen PROFITABLE Lifetime Leads. Stop finding leads one by one and spending hours if not days straining your fingers and eyes – leading to a painful headache. Stop only reaching 10% of your prospects, save money from using negative Search Audiences. Stop spending thousands of dollars on FB ads every month, convert your super targeted leads into customers! Reduce your Facebook advertising spend by maximizing your sales from TARGETED leads and customers. Close sales with targeted email marketing automation campaigns to leads and new list subscribers. By letting the advertiser specify an ideal audience as an email list, Custom Audience improves targeting for Facebook Ads. Stop Talking and Trust Me, You Need It! Your Rights: You get Personal use license to the Software. Software code based on FB API support, so we will not be responsible for the refund when the unwanted changes. But we are committed to always be in charge of fixing bugs, replacing other similar products so that you always get the best benefits when using our products and services. To protect users and against cracker, so we encourage you to consider before you order. We do not refund when you paid software.